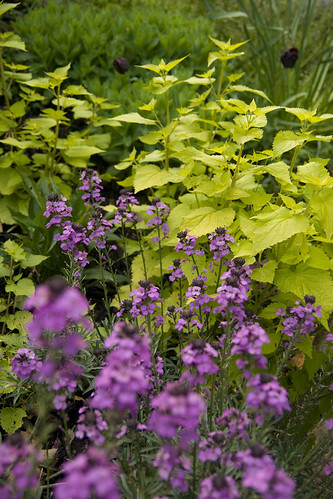 I think my biggest weakness in trying to design a garden is thinking in the big picture. I tend to visualize things in smaller vignettes, and sometimes when I step back and look at the garden as a whole, I'm like "WTF...it is such a mess!" Nevertheless, I enjoy the little victories, such as this nice combo that has turned out pretty well, if I must say so myself. 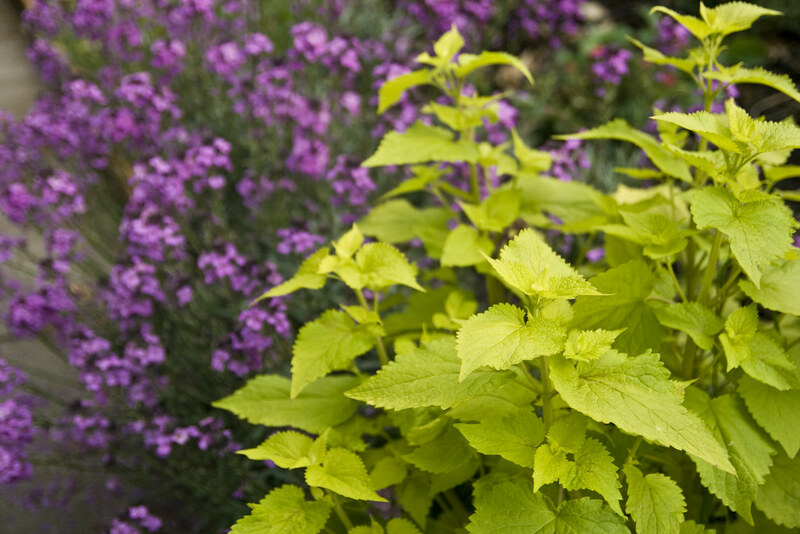 The "Golden Jubilee" Agastache has great chartreuse foliage that looks good spring, summer an fall...emerging a nice purplish color and eventually reaching the golden color it's known for. In summer, it will get lots of nice blue flowers that last for quite a while, especially if deadheaded promptly. The erysimum blooms pretty much non-stop once it starts, seemingly blooming itself to death, as they need to be replaced every few years. My partial shade garden also has a tendency to make them very leggy, so I've had to move them around to get a decent effect. Nevertheless, I'm enjoying this combo while it lasts! I know exactly what you mean about looking at the garden as a whole and thinking it's just a big jumbled mess. I do it all the time. What really amazes me, though, is that I look at the same area a few days later and I think it looks great. I have decided that perennial gardening is just that way--one day it's beautiful, two days later it's a mess, then something else begins to bloom and it looks good again. 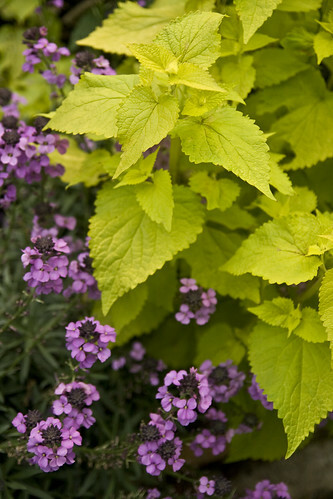 I do love your chartreuse foliage with the purple flowers. Such a great combo!